We have a detailed easy to use Interactive parts look-up system in Color to help you find those Bad Boy Lawn Mower Parts your looking for at the best price possible with the fastest shipping available normally in 2 days. Use only Genuine Bad Boy Mower Parts! 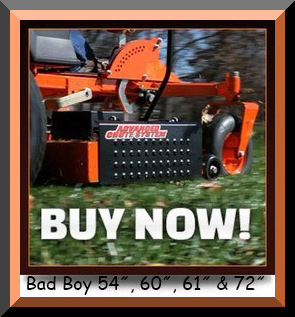 Bad Boy Lawn Mower Parts is your trusted source for original Bad Boy Parts, Accessories & Equipment. We carry a full selection of all Bad Boy Mower Parts at THE Lowest Prices Online. We are not Bad Boy Mowers, Inc., but we are affiliated with them. We are one of their largest dealers in North East Florida. and 100's if not 1000's of Bad Boy Mower Parts. If you have any questions at all, please feel free to give us a call at (904) 259-5494.
including Bad Boy Mowers, Inc. Here at Bad Boy Lawn Mower Parts we strive to offer you the most user friendly Parts Look-up Diagrams possible with very fast and accurate Bad Boy Mower OEM Parts at an affordable price. Please feel free to contact any of our team members with questions or comments about the web site or if you are having a problem finding that one particular part. Thank you for shopping with BadBoyLawnMowerParts.com. Our Bad Boy Customer is our First Priority. At badboylawnmowerparts.com, we have thousands of Bad Boy Mowers Parts in stock for you. We carry the most common and fast moving Bad Boy Parts, as well as the Bad Boy Mower parts that are hard to find. Bad Boy Belts, Bad Boy Blades, Bad Boy Spindles, Bad Boy Pulleys, Bad Boy Service Kits and Bad Boy Owner's Manuals. If you know your Bad Boy part number(s) then type it into our Parts Lookup section (click the magnifying glass) to search and purchase. If you don't know the Bad Boy mower parts numbers, No Worries! Point to Parts Look-Up, then choose Bad Boy Parts Look-Up. In this section you will find our diagrams / schematic views of all of the Bad Boy Mowers (AOS, CZT, PUP, Lightning, MZ, ZT or Outlaw Series). These allow you to choose your Bad Boy Mower year, then model, then select the section of the mower you are working on. Just scroll down to the large schematic drawing and just point and click on the number for the exact Bad Boy Mower part you need. We have thousands of Bad Boy Mower Parts in stock. Surely we have what you need to get your Bad Boy Mower back up and running. We are a Bad Boy Mower Dealer with experience and expertise in this industry since 1999. Our 18+ years of Parts Knowledge is at your disposal for getting the right Bad Boy parts to you both quickly and easily. Our mission is to get you the right Bad Boy Blade, Bad Boy Belt or Bad Boy Service Kit or Bad Boy Part that you need quickly and accurately, the first time. But if an issue does arise, we are dedicated to make it right for our Bad Boy Mower Customer. or whichever accessory you want for your Bad Boy Mower! If you can't find what you need, don't hesitate to give badboylawnmowerparts.com a call. We are here to help you! During office hours call us at (904) 259-5494, after hours shoot us an email at badboylawnmowerparts@gmail.com. We are always happy to assist our Bad Boy Customers. We appreciate you choosing Bad Boy Lawn Mower Parts as your source for Bad Boy Mowers, Bad Boy Mower Parts and Bad Boy Mower Accessories. Let our experience lead you so you can keep your Bad Boy Mower in tip top shape and continue to Mow with an Attitude!